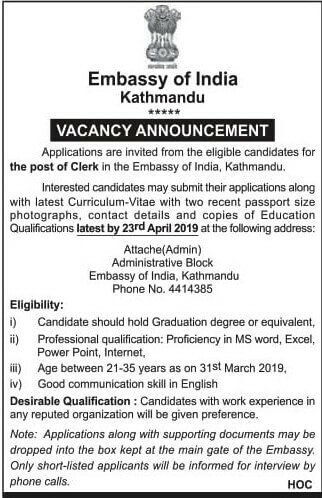 Home / Vacancy / Vacancy Announcement for the post of Clerk in the Embassy of India, Kathmandu. Vacancy Announcement for the post of Clerk in the Embassy of India, Kathmandu. Embassy of India Kathmandu invited allocations from the eligible candidates for the post of Clerk in the Embassy of India, Kathmandu. Desirable Qualification: Candidates with work experience in any reputed organization will be given preference. Note: Applications along with supporting documents may be dropped into the box kept at the main gate of the Embassy. Only short-listed applicants will be informed for interview by phone calls.